As you all know, I suffered my 2nd setback at the end of last year, it has been a big turn off for me going through 2 setbacks 2 years in a row, both at the hands of hairdressers. I keep asking myself how could a simple wash and set turn out so horrendous?? Twice!!?? Well ladies, apparently, what I’m seeing in the mirror and what is are two totally different things. A picture does speak a thousand words! Saying that I am shocked is an understatement; either my eyes or my mirror is playing games with me. 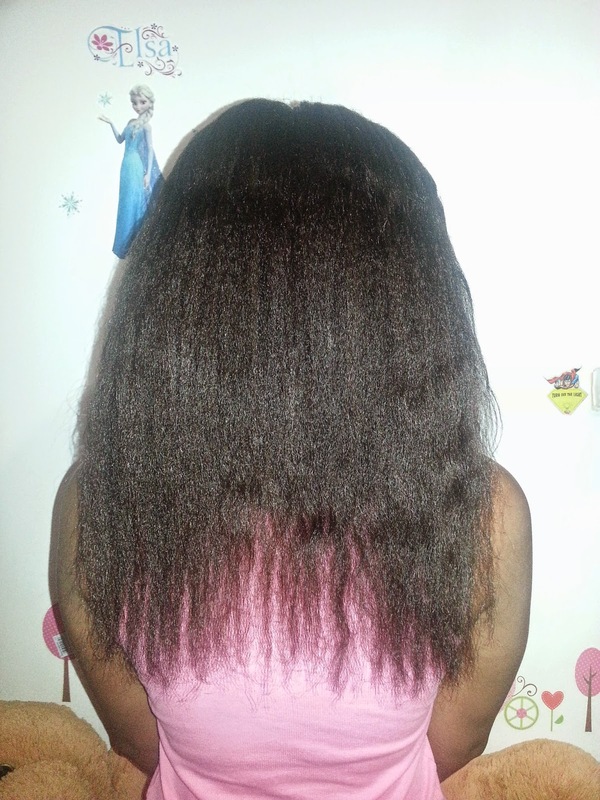 I have trimmed my hair twice since that dreadful day last year and was about to trim again this wash day when my daughter suggested I take a picture. I normally take pictures when I flat iron my hair for length checks but she got fed up of me moping and complaining and wanted to prove that it doesn’t look horrible, well now even she is doubting her own eyes. I am now back to the point of wanting to do another big chop and start all over again, those ends have to go one way or the other. The one thing I’m sure about now is that no one is touching my hair again. But I get you about this hairdressers, I need to assess mine too after my time with the hairdresser! My daughter is saying the same thing, she really don't want me to cut my hair again but those ends don't look cute at all. Well I cleaned my mirror again but I still don't trust it lol I'm just going to do a mini trim until my touch up in April. Mini trims are good. Your hair got longer since the last time I saw it. Please don't big chop. Just keep doing the trims. Hi Candice! I agree with what the other ladies have said do not big chop just yet mini trims will do and honestly I don't think yor ends are that bad it could be probably the way its combed out. Did you take a post flat iron photo to compare with this one? I'm not going to do a big chop unless my hair is flat ironed, which won't be until my next touch up so we will see then. I feel your pain!! I have pics just like this...mine happened on more than one occasion even. I've handled it mutiple ways - gradual and big chop. Chopping definitely bounces me back quicker although it emotionally hurts a bit more initially than gradually trimming. I rather just cut my losses and do a big chop but it seems like the person who helps me cut my hair is more attached to it than I am lol would you believe that we agrued for over half an hour about the amount to cut when I wanted to cut my hair in April after my touch up? We eventually settled on 3 inches smh I am gradually getting rid of the damage, I'll see where I'm at by the end of the year.